Hundreds of Hindu right-wing activists disrupted vehicular movement, and vandalised shops and offices of the ruling CPI(M). Thiruvananthapuram: Kerala was in ferment on Thursday, a day after two women of menstruating age group entered the Sabarimala temple, with agitators blocking roads by placing burning tyres and granite blocks, vandalising KSRTC buses, and clashes leaving three BJP workers injured in a knife attack. Meanwhile, four Congress workers were hit and injured by the pilot vehicle of Kerala Chief Minister Pinarayi Vijayan when he was returning home from office for lunch, party said. The dawn to dusk shutdown called by Sabarimala Karma Samithi, an umbrella organisation of various pro-Hindutva groups, and the Antarrashtriya Hindu Parishad (AHP), plunged the state into turmoil, as hundreds of Hindu right-wing activists disrupted vehicular movement, and vandalised shops and offices of the ruling CPI(M). The state was under siege as strike supporters clashed with police and the ruling CPI(M) activists at several places. In Thiruvananthapuram, agitators hurled country-made bombs on the police personnel. 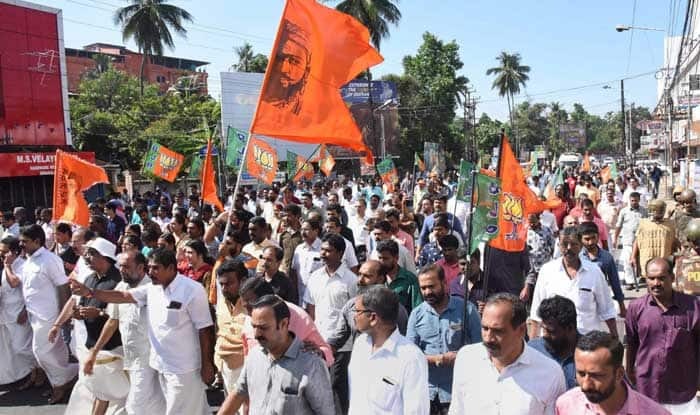 In Thrissur, three BJP activists were stabbed during a clash with workers of the Social Democratic Party of India (SDPI), the political wing of Popular Front of India, a militant Islamic outfit, police said. Around 100 media personnel, including women, have been attacked in Kerala in the last two days since protests erupted. Also, around 100 state-run buses have been vandalised by the protesters. In view of the one-day hartal in Kerala over the issue, the Tamil Nadu State Transport Corporation suspended services to Kerala. About 25 bus services were cancelled, police said. According to reports, so far 266 people have been arrested and 334 people have been taken into preventive custody for the various shutdown-related violence. Also, 60 workers of a Tamil Nadu -based fringe Hindu outfit who were trying to stage a ‘rail-roko’ in Coimbatore. The special branch would prepare the list of those indulging in violence and hand it over to the district police chiefs for further action, the police said in a released. A photo album of the perpetrators of violence would also be prepared, the release said, adding that special teams would be set up to arrest those agitators involved in violence. Mobile phones of suspected persons would be confiscated and sent for digital examination and raids would be carried out at their homes, to unearth arms, if any, it said. A 55-year-old man, who was seriously injured when CPI (M) workers hurled stones at protesters from atop their party office at Pandalam in Pathanamthitta district, died late Wednesday night. However, Vijayan told media that the man, Chandran Unnithan, died due to cardiac arrest. Unnithan was part of the protest march taken out by Sabarimala Karma Samiti on Wednesday evening which came under attack by CPI(M) workers. Nine people accused of involvement in the attack have been identified and two of them arrested, police said. As tempers ran high in Kerala, the Supreme Court Thursday refused to urgently hear a contempt petition moved by a lawyers’ group against Sabarimala temple authorities for closing the shrine for purification after two women entered it. Advocate P V Dinesh appearing for Indian Young Lawyers Association told the bench that the temple authorities closed the shrine Wednesday for purification after the women’s entry which was in violation of the apex court verdict. Vijayan, who blamed the BJP-RSS combine for the violence, warned of stern action against the perpetrators. He told reporters here that the government was not against the belief of the believers, but owed allegiance to the Constitution. “There was a clear planning to the violence unleashed by the hartal supporters. Since yesterday, there has been so much violence. Media personnel, including women, and police were among those attacked,” Vijayan said. Protest demonstrations by the BJP and Sabarimala Karma Samithi turned violent at several places in Kozhikode, Kannur Malappuram, Palakkad and Thiruvananthapuram. Police used batons and water canons to break up protests. The office of the CPI at Palakkad was attacked by the protesters and the vehicles parked in front of it, including state transport corporation buses, auto-rickshaws and police vehicles were pelted with stones. Agitators hurled a crude bomb at a local beedi manufacturing unit managed by the CPI(M) in Thalassery in Kannur district, but it did not explode, police said, adding 10 right-wing activists were arrested. Another crude bomb was thrown at Nedumangadu police station about 17 km from here, officials said. It was not immediately known whether it went off and caused any damage. Journalists staged a protest march in the state capital after they were allegedly assaulted by protesters. The state’s police chief Lok Nath Behera said a special team will probe the assault on media. Normal life was thrown haywire because of the shutdown, as shops and hotels remained shuttered in the state capital. However, defying the ‘Hartal’ call, some shopkeepers opened their establishments on SM Street, a major trade hub in Kozhikode, besides a few places in Kochi and Kollam under police security. CPI(M) offices were pelted with stones in Ernakulam and Mallapuram districts, while a library managed by the party in Palakkad was also vandalised. Some Youth Congress workers were injured when they were hit by the pilot vehicle of the chief minister’s convoy while they attempted to show black flags to Vijayan. The Congress is observing a ‘black day’ against the entry of women into the Sabarimala shrine, the abode of its perenially celibate deity Lord Ayyappa. Bindu and Kanakadurga, two women in their 40s, had defied dire threats from saffron organisations and offered prayers at the temple that was out of bounds for girls and women between 10 and 50 years of age, breaking the centuries- old tradition and infuriating the Hindu right. Scores of protesters were arrested from different parts of the state for breaking peace. The state’s universities postponed the examinations scheduled for Thursday. The state was under siege as strike supporters clashed with police and the ruling CPI(M) activists at several places. Around 100 media personnel, including women, have been attacked in Kerala in the last two days since protests erupted. Four Congress workers were hit and injured by the pilot vehicle of Kerala Chief Minister Pinarayi Vijayan.